We use cutting edge technology to restore your tiles & grout to new again. Tile cleaning Brisbane uses natural cleaners and a high pressure tile and grout cleaning tool to get your floors their cleanest. Pre-Treatment – First we apply a treatment which begins to break down the grease and soil. Grout lines and difficult areas are then hand detailed. The Process – Then using our truck-mounted machine we thoroughly scrub and rinse the floor with a powerful tile wand. The wand operates at extreme pressures which render your ceramic tile and grout spotless. 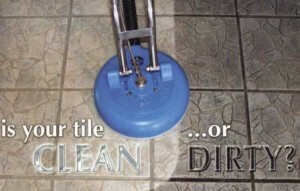 The high-pressure Cleaning Tool is combined with a vacuum to remove all dirt and debris on ceramic tiles. This not only deep cleans the tile but also renovates the grout lines, which is ideal for all tiled surfaces including kitchens and bathrooms.